Overall, the Love Cuffs were a bit disappointing. I did not like that they were easy to escape or that they were too small to fit ankles. On a positive note, the cuffs are durable. My partner likes that they are cute. The Love Cuffs are simply a pair of fuzzy handcuffs with the purpose of restraining yourself or someone else. In our first experience with the cuffs, we used the cuffs to secure the hands behind the head. We used rope for extra hold and for the legs. My favorite feature of the cuffs are the cute keys that are attached to the links connecting the cuffs. The keys can be removed and are functional. The links connecting the cuffs limit the positions that can be used. The cuffs are made of metal and the fur is faux. The fur is soft but not extremely soft and has a decent texture. The metal is well-made and durable. The Love Cuffs came in a small black box with red writing that says "Da Cuffs" and a variety of other phrases in white writing. The product works, for the most part, as intended. There is a safety lever for quick escape if something should go wrong. However, this can also be problematic when the cuffed person is feeling playful (I like to make a game out of trying to get free). Also, the Love Cuffs are advertised as wrist and ankle cuffs but the largest setting for the cuffs is about 7 inches around so someone would have to have very very small ankles. The fur covering the metal can be removed for couples interested in temperature play. This also makes the cuffs easy to clean if they get soiled. I would recommend gently hand washing and air drying the fur part so it does not fall out in the machines. 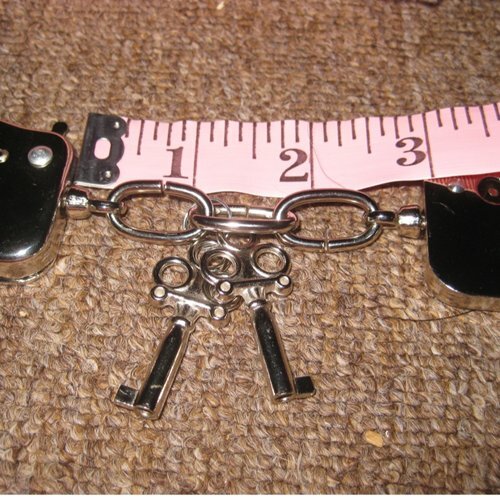 There is a small clicking noise when the size of the cuffs are adjusted and the keys jingle lightly against the links and cuffs, but other than that the cuffs are very quiet. The Love Cuffs continue to be a useful product. It is a little sad that they discontinued them. They are cute and can add a touch of kink.